So far, this trilogy is turning out to be more of a whimper than a roar. Book 1 seemed to have much more oomph than book 2 did. I miss the scandal, the sneaking around, and the nightlife!I was looking forward to more of this......and instead I sat around waiting for things to happen.Now, don't get me wrong. Anna Godbersen can write the heck out of coming-of-age stories. I love how her passion for the style and feeling of an era shines through in every single thing she writes. But I was missing the heart-stopping drama and turmoil which normally leaves me reeling every time I put down a Godbersen book. It seemed like I was on an emotional roller-coaster while I made my way though her Luxe series. At the end of Bright Young Things, I was very curious to see what would come next. I can't say that I had the same intense feeling this time around. 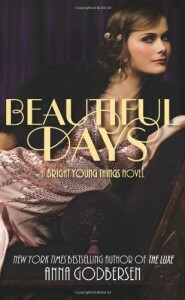 Granted, there were a couple of twists thrown in near the end of the read which had me thankful that the intrigue wasn't completely over, but I had been hoping for more.Our three leading ladies still have miles to travel.We have the budding starlet, the debutante, and the bootlegger's daughter. Each girl has her own dream, but who will get what she wants? As of right now, I have no clue. Basing this series on my previous experience with this author, I'm guessing maybe 1 or 2 of the girls will get a happy ending. It wouldn't surprise me if I ended up getting something completely different from what I want.Max...frustrating Max...It's the 1920's - the age of illegal booze, seedy clubs, and scandalous happenings. Max is the mysterious "flyboy" (pilot) and his character had so much potential. Unfortunately, it took forever to see any. For most of the book, he was just DULL. We finally got some intrigue near the very end, but I think the same "twist" was handled better with a relationship in the book [b:Vixen|7903851|Vixen (Flappers, #1)|Jillian Larkin|http://d202m5krfqbpi5.cloudfront.net/books/1320413887s/7903851.jpg|11163528].I'd been hoping for him to be more like this......and instead got a stick-in-the-mud who didn't know how to have fun...The boy was one step away from being in the Women's Temperance Movement. Although, his scene with Cordelia up in the air was my favorite scene of the book. I could almost picture being right there, flying with them.There was something ruthless about the way that he brought them up and up; but it was almost unmistakably the way a person went about doing something they loved.To the book's credit, there was an intense bit of something going on at the end but I thought it took too long for us to get some good action.Maybe I've been spoiled with one too many seasons of Boardwalk Empire.Even though I didn't enjoy Beautiful Days quite as much as the previous book, I was still happy to be back in Godbersen's world. I'm pretty sure that I'll have to pick up book 3 soon to see how everything turns out. And I'm sure I'll follow her on to whatever endeavors she decides to take on in the future.